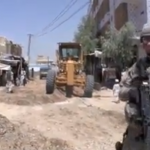 Video: Afghan security contractors undermine the U.S. counterinsurgency strategy. KANDAHAR, Afghanistan — When a commercial convoy hauling supplies for U.S. and NATO bases came under attack from Taliban insurgents in the western Zhari district of Afghanistan, the Afghan private security contractors hired to protect it responded by taking turns firing light machine guns from the hip — for almost three hours. The barrage of rounds was shot so indiscriminately — U.S. soldiers derisively referred to it as the “spray and pray” method — that they were just as likely to hit innocent civilians, or their own men, as they were the Taliban. If this kind of undisciplined response were the exception, U.S. and NATO commanders might not be so concerned. But it is such a regular occurrence, they say, that allowing it to continue could undermine the counterinsurgency strategy here, which puts civilian protection above almost all else. Civilian deaths threaten support for the U.S.-led war both in Afghanistan and in the United States — and they are on the rise. A U.N. report released Tuesday said civilian casualties had increased by 31 percent in the last six months. And a major offensive in the southern province of Kandahar that is just beginning is almost certain to lead to more civilian casualties. The exact number of civilian deaths in Afghanistan, like most war zones, has never been clear. NGOs, mutilateral groups, the U.S. military and the Afghan government have all given different estimates. The classified military documents released last month by WikiLeaks indicated the toll might be higher than the U.S. military has so far reported. 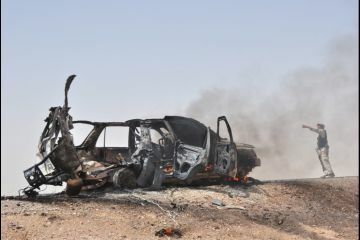 And GlobalPost’s own investigations on the front lines in Afghanistan, including in Taliban-controlled territory, reveal that some civilian casualties, sometimes numbering in the dozens, often go totally unreported. Lt. Col. Peter Benchoff is commander for Forward Operating Base Howz-e-Madad, just north of a stretch of Afghanistan’s Highway 1, where the convoy shootout and many others have taken place. “Regardless of who does it [injures or kills civilians] — insurgent, private security, Afghan national security forces or U.S. forces — that is all instability we have to stop because we can’t have improvements in this environment when security is still bad,” he said. One recent and unsettling example of this is the death of Anar Gul, a civilian doctor. She, her husband, Pad Mohammed and their young daughter Summaya were driving near the Howz-E-Madad village market when they got stuck behind a commercial convoy that was attacked by the Taliban. The Afghan security contractors protecting the convoy returned fire. When Gul’s husband pulled forward to drive around the convoy, a projectile smashed through the windshield and pierced his wife’s neck. Medics believe it was either a piece of shrapnel or a bullet. Mohammed put her in the backseat and drove inside the gates of the nearby U.S. base. But in the short 20 minutes between the incident and arriving at the base’s Combat Aid Station — Gul died from blood loss. It’s uncertain which side or what kind of weapon killed Gul. But when the family car came between the two hostile forces trading fire, she lost her life. And while there are not accurate records of the number of civilians being wounded or killed in shootouts between the Taliban and security contractors, informal surveys of several American Combat Aid Stations in the region seem to indicate that the casualty figures are significant. Capt. Matt Rodgers, a former battalion surgeon said that at least half his 300 plus trauma cases in Kandahar province were either security contractors or civilian victims caught in the crossfire. More than 50 private security firms have registered with the Afghan government and the majority of their estimated 25,000 personnel are Afghans. But there are, critics say, dozens more unlicensed groups also providing “protection” and doing so with little training or discipline, which is leading to more civilian casualties. In fact, allegations against abuses by both licensed and unlicensed security contractors — including rampant corruption, drug use and murder — have become so numerous that investigators for both NATO and the U.S. Congress’ national security subcommittee are looking into them, according to the New York Times. One of the most disturbing allegations is that domestic security contractors might have actually paid the Taliban to stage attacks against coalition forces to help justify their existence. The organizations have also been accused of bribing the Taliban not to attack convoys they’re charged with protecting. Watan Risk Management, one of the largest firms, has publicly denied the allegations. The majority of companies, however, have not responded. If the accusations prove true, it could mean that at least some of the $2 billion the U.S. military pays Afghan and American trucking companies to move their supplies and materials throughout the country might be going to the very Taliban forces they’re trying to defeat. Officials said the U.S.-led coalition in Afghanistan uses domestic security firms, as opposed to foreign firms, partly because they come cheap. Maj. Joe Harper, an American spokesman for coalition forces, said that private security contractors play a vital role in supporting the mission. But the military is aware of the problems they pose, he said. With the military surge in Kandahar province, American and other forces are relying on the movement of supplies more than ever to provide for a growing numbers of troops and their push into more remote and hostile territory. But getting them without jeopardizing the counterinsurgency strategy is proving difficult. Carter said the solution lies in Kabul. But while Afghan President Hamid Karzai has voiced his desire to phase out private security contractors — the potential for a government solution remains questionable. Some of the larger firms, including Watan Risk Management, have family ties to either the office of the president or the Ministry of Interior, which is responsible for their regulation. Coalition forces have created a taskforce to address problems with domestic private security contractors in an effort to bring them in line with the counterinsurgency strategy. But as the Kandahar offensive gets underway, and a looming deadline for a withdrawal of American troops next year approaches, time is of the essence. In a new directive to his troops, Gen. David Petraeus recently re-emphasized the importance of protecting the civilian population.